The Hospital of Central Connecticut's Stroke Center treats patients who have had strokes and TIAs (transient ischemic attacks). A stroke occurs when a blood vessel becomes blocked by a clot or bursts, interrupting blood flow to the brain. Deprived of oxygen and nutrients, the brain begins to die, resulting in disability or death. Emergency stroke treatments at both its New Britain General and Bradley Memorial campuses. Education for hospital inpatients and the community on stroke risk factors and warning signs. Coordination of rehabilitation services for stroke patients to ensure continuity of care for stroke patients. Rehabilitation services include physical, occupational and speech therapy, Care Coordination/Continuing Care, food and nutrition services and a variety of hospital wellness programs that can help with lifestyle changes. The Stroke Center provides education for hospital inpatients and the community on preventing strokes by identifying risk factors. The hospital's Stroke Center educates the community and hospital inpatients on identifying stroke symptoms. We offer patients screening using advanced image processing technology known as RAPID CT Perfusion, which pinpoints the area of damage caused by an ischemic stroke, locates salvable areas of brain tissue, and can establish a timeline for when the stroke occurred. This increases the window for acute treatment up to 24 hours. Hospital specialists who treat stroke include emergency physicians, cardiologists, interventional radiologists, neuro-, vascular and general surgeons, neurologists, and hospitalists. The Hospital of Central Connecticut is certified by The Joint Commission and designated by the Connecticut Department of Public Health as a Primary Stroke Center, making quality stroke care accessible to Central Connecticut residents when minutes count. 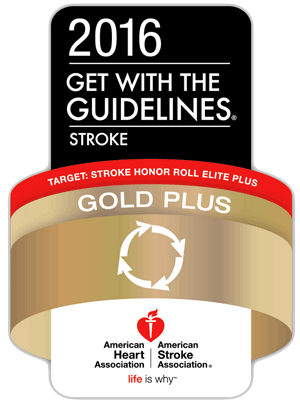 The Hospital of Central Connecticut (HOCC) has received the American Stroke Association’s Get With The Guidelines® Stroke Gold Plus Achievement Award as well as the Target: Stroke℠ Honor Roll Elite Plus Award. Earning this recognition is directly related to meeting specific stroke care quality measures.